Last month I worked as a wine auctioneer for a benefit auction in Oak Brook, IL. 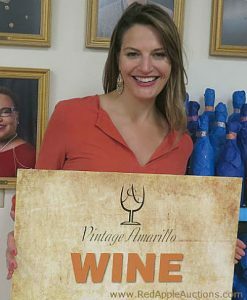 It was my second wine auction in 2017. The other event was for a nonprofit in Texas. In this post, I’m featuring both of them. If you’re running a wine auction or considering launching one in your community, take a look at how these two fundraisers are structured. Both of these are successful events in their markets. Let’s look at highlights from each event. 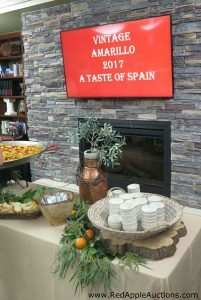 Earlier this year, the Amarillo Symphony in Amarillo, TX held its Vintage Amarillo. This is a smaller, more intimate event. But like many larger wine auctions in the country, Vintage is a two-day affair. The first night is the preview party. It’s an upscale cocktail reception with great wine, tasty food stations, and a small live auction. The night is primarily about socializing. Tickets for the preview party were much less than the cost of the gala tickets and were designed to attract a younger crowd. The second night is the sit-down dinner gala. It attracted about twice as many guests as the preview party. 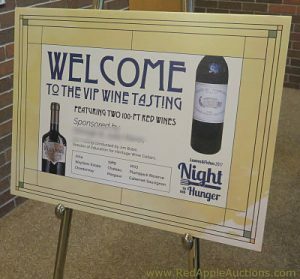 It followed the format of a more traditional event, with a silent auction and large live auction focused on wine lots. Vintage is held every-other year. This isn’t the only fundraising event the symphony runs. Not everyone enjoys wine, so they have another larger event that isn’t focused on the grape. Here’s a video showing highlights of the event. Loaves and Fishes Community Services’ in Naperville, IL launched Night to End Hunger in 2014. Though not a 2-day affair like many wine auctions, the event did have two components. At 5:00 pm (one hour prior to the start time of the gala), a sub-section of guests gathered with a sommelier for a 100-point wine tasting and nibbles. It was educational and social. At 6:00, the tasting ended. Attendees walked to the ballroom where guests were starting to arrive for the gala. As with many wine events, this portion of the evening included outstanding wine, a great meal, a curated silent auction, live auction, and so forth. Like Vintage, this event was intended to be run every-other-year. But the group’s 2016 event was so well-received, they offered this event again in 2017. It’s also worth noting that nearly everyone working on Night to End Hunger this year was new: New CEO. New vice-president of advancement. New special events manager. New auctioneer (me). That doesn’t always bode well for an auction, but it worked! Are you ready to run a wine auction? Or maybe you already do. Feel free to leave your thoughts, questions, or comments below. Thank you for sharing all of these ideas. I really enjoy getting fresh ideas for our area. I am one of those people who is always needing something new, because in our very small town, ideas get recycled very readily. This can be very frustrating for the person who did the original event, so I try to look outside my area and our comfort zone. I love the wine pull idea as an add on to an event. Do you have more information on that somewhere? The wine upgrade is also something I could see working at many event types. I particularly love the idea of a pre-event for large donors/sponsors. Jennifer, the basics of a wine pull would be, for instance, to secure 25 bottles of donated wine, put 25 numbered corks into a bowl, and have guests pay a flat amount (say, $30) to pull a cork to win the bottle of wine that correlates to the number on the cork they pulled. Though there are subtle nuances to it, that’s the gist of a wine pull.